"Don't believe everything you see in the movies." John Stanley was one of the hosts for Creature Features, a local late-night horror movie program that ran in the San Francisco area from 1971-1984. Stanley's apparent deep-seated love for all things horror-related eventually led him to put a film of his own together, and he wrote (along with Kenn Davis) and directed this 1976 vampire film that has a distinctly movie-fan-friendly plot. The story is set at a movie nerd's Mecca, the horror convention, held at a once elegant movie palace, with the main attraction and guest-of-honor being legendary vampire film star The Great Malakai (Jerry Walter, here doing his best Christopher Lee), who one character refers to as "one of the film greats, it's like having Lugosi, Karloff, Christopher Lee, or Vincent Price." The twist is that Malakai is rumored to be a little too into his film roles, which turns out to be justified when it is revealed early on that the actor partakes in some kind of weird blood-drinking ritual, and that his vampirism may actually be quite real. When a series of murders coincide with Malakai's appearance at the convention, suspicions are cast and it is up to a truly mismatched team of heroes to save the day. The good guys here are a pleasingly odd lot, led by horror writer Professor Seabrook (Dan Caldwell), fashion designer Cindy (It's a Living's Barrie Longfellow), amateur detective Scotty (John Cochran), a Zen-like comic book store owner, and eventually the Nazi-hunting Tobias Ben-Halik (Irving Israel), known by the moniker The Avenger. Stanley and Davis reveal their deep and well-heeled love of classic horror by layering Nightmare in Blood with all sorts of rather hip references and discussions about the genre, and even a couple of pivotal supporting villain characters (whose true identity isn't revealed until midway into the story) should be immediately familiar to any Hammer buffs. More often than not characters take time to discuss the various nuances of cinematic terror, and clever moments like Malakai ridiculing the physical impossibilities of having a man turn into a bat have a cool, inside, nudge-nudge-wink-wink effect that keep Nightmare in Blood from ever seeming to take itself too seriously. The plot digs deep into unexpected B-movie weirdness during the second half, just about the time the crazy Nazi hunter shows up, and though characters casually dismiss the death of other characters (including one's fiancée! ), the inside jokes and references somehow make the stiff acting and low-rent effects certainly far more tolerable. Dan Caldwell's brooding Professor Seabrook gets to spout a wonderful "watch the skies" warning that would have been at home in any of the alien invasion/Red Menace movies of the 1950s, and the nostalgic curiosity of seeing an out of retirement Kerwin (The 7th Voyage of Sinbad) Matthews playing a swashbuckler in the opening movie-in-movie is another of those great fan homage moments that Stanley has been careful to sprinkle throughout. Image Transfer Review: Image has issued Nightmare in Blood in a 2:35:1 anamorphic widescreen transfer, kind of a pleasant shock for a low-budget mid-1970s horror flick, so proper thanks go to them for resurrecting what was likely one of the few remaining prints. The expected age-related issues are evident, with plenty of scratches, grain, and nicks throughout (especially during the first ten minutes or so). Colors haven't held up much better, and do tend to have a somewhat washed out look to them, with black levels appearing more muddy than deep, which is a shame in a film that spends so much of its time in dark settings. Still, the age issues are not wholly unusual for a film of this vintage, and the presence of the anamorphic widescreen transfer almost offsets the imperfections. Audio Transfer Review: The original English mono track is the single audio choice here, and aside from some minor hiss there isn't anything particularly unpleasant about the transfer. Dynamic range is naturally limited, but dialogue is always discernible and sharp. 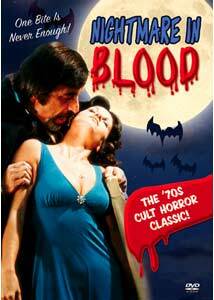 Extras Review: Under the lurid heading of "Blood-Curdling Special Features", writer/director John Stanley and writer Kenn Davis provide a full-length, scene-specific commentary track for Nightmare in Blood. Given the film's age, Stanley and Davis never really seem to be at a loss for things to talk about, whether it is the basics like location info or how Kerwin Matthews was lured out of retirement for his opening cameo in the movie-within-a-movie. Trust me on this one: if you found Nightmare in Blood even remotely interesting, you should give a listen to the Stanley and Davis track. The rest of the extras consist of clips from Stanley's late 1980s Creature Features (apparently a local San Francisco-based horror movie show), and the four segments are a real hodgepodge. Interview with Leonard Maltin (09m:30s) is circa 1983, and features Stanley chatting it up with the perpetually smirky film critic, who here is touting is yearly movie review book, and it suffers from appearing to have been culled from an extremely bad video tape. The Bad Seed Segment (01m:39s) is a hammy interpretation of a scene from the classic William March novel, while Revenge of the Tiger (05m:25s) is a prolonged (emphasis on prolonged, really) martial arts exhibition. The Interview with Richard Jewell (06m:58s), author of the heavy, oversized RKO Story, is probably the most informative, and offers a quick Stanley-moderated recap of the studio's golden age of horror. I would have preferred more Jewell and less kung-fu, personally, but that's just me. In addition to a brief automated photo gallery, the disc is cut into 15 chapters. Perhaps not the most polished horror film ever made, Nightmare in Blood has a fairly clever storyline that lifts it above the typical low-rent predictable vampire flick, and for old-school genre fans this is an easy recommendation. Image gets high marks and boosts the street cred for this title by releasing it in 2.35:1 anamorphic widescreen, too.